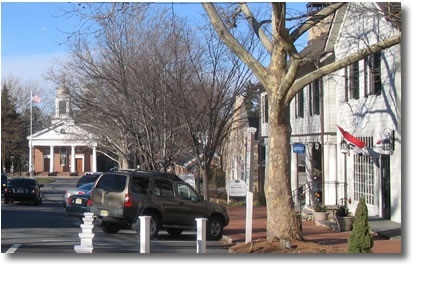 Basking Ridge (Bernards Township) is characterized by the tree-lined main street and slice of history that is the heart of this charming colonial town. The area comprises almost 25 square miles surrounded by the towns of Bernardsville, Harding, Long Hill, Liberty Corner, Bedminster, and Martinsville. Many people were drawn to this small town for its easy access to transportation via Routes 287, 78, 202, and the New Jersey Transit system. Bernards Township is referred to by the locals as Basking Ridge because the town rests as a ridge where deer basked in the sun. The terrain descends down to the Watchung Mountains which lie south. Commuters found the Town situated about 33 miles west of Manhattan commuter friendly with NJ Transit Bus and Train service direct to Manhattan. Many of these residents settled in Basking Ridge after AT&T established corporate headquarters at the intersection of 287 several decades ago. There was even small reference to the area in “War of the Worlds, " in which the 'aliens' land in the nearby Great Swamp. Bernards Township/Basking Ridge has its own school system which was granted an award of excellence in the early 80’s from US Department of Education. This set a new standard that neighboring towns have sought to meet with success since the establishment of the NJ Core Curriculum Standards. There is Ridge High, William Annin Middle School, Cedar Hill, Mount Prospect and Oak Street Elementary. Since the 80’s Basking Ridge has seen tremendous growth. The cluster development known as “The Hills” at the Bedminster border offers condominiums, town homes, and a range of single family homes. with a private golf course on the hill. There is a choice of Pre Schools as well as access to private colleges, community colleges and Rutgers State University. There is adult day care as well. The Bernards Township Recreation department offers a wide variety of sport and education opportunities for youths and adults. There is a community pool and golf course, Somerset County Sterling Stables riding school and stables. The Girl Scouts and Boy Scouts are active. There is the Health Department, Police and Fire Department. It is known for its soccer clubs and programs. There are a variety of churches and a Jewish Center, a large variety of clubs and organizations. Fellowship Village Continuing Care, Ridge Oak Senior Housing as well as adult day care accommodations meet the needs of seniors.